Every 10 years the quietly methodical Census leads to blood on the floor of most state legislatures, as members try to convert the population numbers into districts from which they and their fellow politicians in the U.S. House will run for reelection. If anything, there’s even more blood flowing than usual in 2011. The political maneuverings are a constant, but so is the change generated by population patterns. Virginia is a good example. 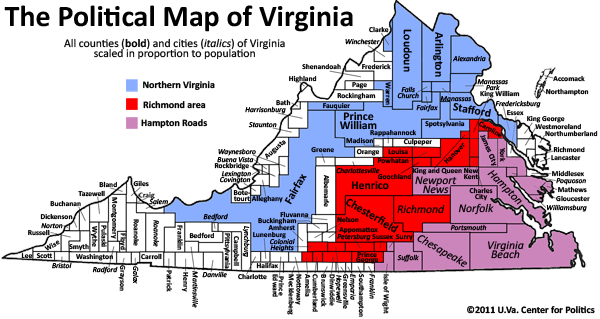 A predominantly rural state for much of the 20th century, the Old Dominion has become a fast-growing urban-suburban New Dominion. 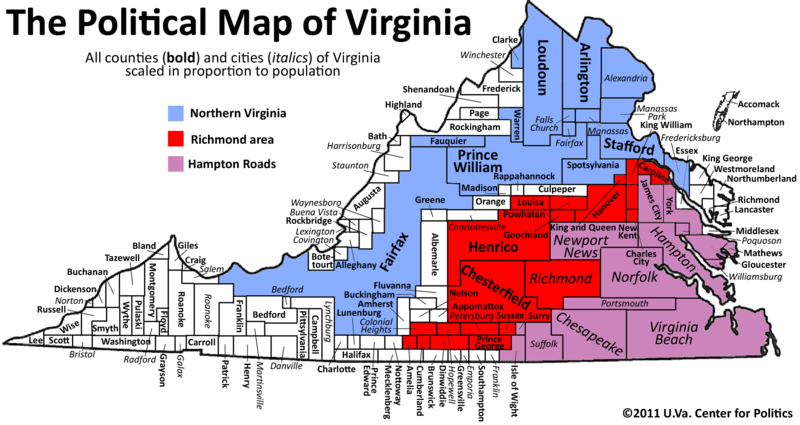 In every decade since 1950, the behemoths of Northern Virginia, the Richmond metropolitan area, and Hampton Roads have grown substantially. Similar maps can be done in all 50 states. They are useful teaching tools, helping citizens and students understand why and how a state has changed politically and culturally. We hope you enjoy it. Individuals, groups and the news media may reproduce this map with proper copyright credit.